Diversity has been a focus of higher education policy, law, and scholarship for decades, continually expanding to include not only race, ethnicity and gender, but also socioeconomic status, sexual and political orientation, and more. However, existing collections still tend to focus on a narrow definition of diversity in education, or in relation to singular topics like access to higher education, financial aid, and affirmative action. By contrast, Diversity in American Higher Education captures in one volume the wide range of critical issues that comprise the current discourse on diversity on the college campus in its broadest sense. This edited collection explores:legal perspectives on diversity and affirmative actionhigher education's relationship to the deeper roots of K-12 equity and accesspolicy, politics, and practice's effects on students, faculty, and staff. 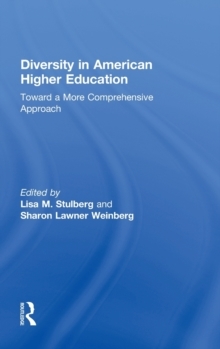 Bringing together the leading experts on diversity in higher education scholarship, Diversity in American Higher Education redefines the agenda for diversity as we know it today.